Increasing quality standards in industry require more sophisticated measuring tools. 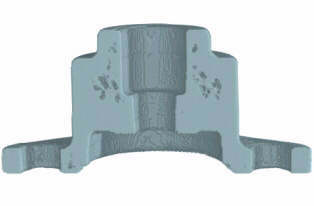 Casting materials are widely used in industrial applications. However, material defects and deviations from the nominal geometry have to be detected in the early phase of the production process optimisation. Common measuring methods are either destructive or the application is limited to simple geometries due to physical limitations of the measuring principle. 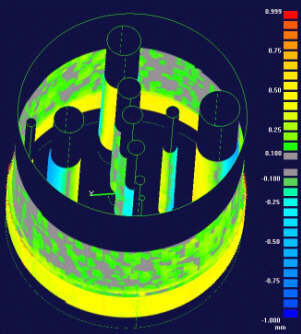 A 3D X-ray tomography system is described that allows the inspection of castings of any complexity. With a single scan 3D objects can be reconstructed and up to 1000 slices can be analyzed. Since both material and geometry data can be retrieved from the measurement, the results can be used for the detection of defects as well as for the investigation of geometrical and material variations. An analysis of the 3D shape and position of flaws, dimensional measurements of inner and outer structures and a comparison of the measured geometry with CAD data can be done. 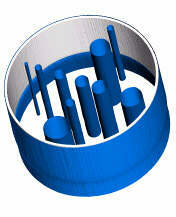 Reverse engineering allows the generation of CAD drawings. The analysis features allow the design engineers to optimize the casting process and therefore to improve significantly the quality of casting components to ensure a safe operation of the products. Light metal castings are widely used in applications such as automotive, telecommunication, mobile computing, etc. The advantages of the material like high strength-to-weight ratio and the ability to produce almost any geometry in few production steps are diminished in some cases by production uncertainties. Therefore, the foundry companies as well as their customers need to perform quality control to guarantee the required specifications. Quality control of castings focuses on two main aspects: Detection of flaws and dimensional measurements. The paper describes how both tasks can be solved with a single non-destructive measurement utilizing state-of-the-art 3D X-Ray computed tomography with an adequate post processing. Conventional third generation X-ray tomographic systems produce two dimensional sectional images (e.g. R.A. Brooks and G. Di Chiro ). Fig. 1 shows the principle scheme of such a system which is used in medical as well as in industrial applications. An X-ray fan from an X-ray source penetrates the object and the attenuation is measured by a linear detector. In medical tomographs the source and detector rotate around the object (patient). In industrial applications it is in most cases advantageous to rotate the object. During the rotation a set of one dimensional projections is measured and reconstructed. The result is a two dimensional image. To get a three dimensional image with such a conventional tomograph, the object has to be moved in the direction of the axis of rotation and several scans have to be performed. A stack of slices has to be mounted to get a three dimensional image. Since the described procedure is very time consuming, we develop tomographic scanners which allow the reconstruction of three dimensional structures with a single rotation. A conical beam from an X-ray source penetrates the investigated object. The attenuated radiation is measured by a large area detector (Fig. 2). In order to irradiate the object from all sides, the X-ray source and the detector are either rotated around the object, or the object rotates in the X-ray cone. During rotation a set of projections is measured and stored. The set of projections is then used to reconstruct the 3D structure of the object. To achieve high quality reconstructions the system needs a careful qualification and optimization of the individual components. The detector which is made of amorphous silicon coated with a scintillator proved to have a dynamic range of better than 75 dB and a linearity of better than 1%. A major source of reconstruction error is the X-ray photon counting statistics. We determined the statistic fluctuations of individual pixels at an optimal irradiation level (70-80% of the saturation value) for different integration times. For the integration time of 200 ms per frame fluctuations under 1% were determined, which guarantee a reduced level of noise in the final reconstruction. Two main families of reconstruction algorithms have been developed for cone beam X-ray tomography with circular source trajectories: the generalized filtered backprojection methods ([Feldkamp et al. ) ]and the 3D Radon transform inversion ([Grangeat )]. In Rizo et al. it was demonstrated that both methods are only aproximativeapproximative. The Grangeat's algorithm provides a density accuracy within 1% for a cone aperture up to 24° while Feldkamp's algorithm is reasonable accurate (within 2-3%) for cone apertures below 20°. On the other hand, along vertical planes; the 3D backprojection (Feldkamp's algorithm) has a higher geometrical resolution because it does not filter along this direction. We optimized the Feldkamp algorithm to reduce density errors in planes far away from the middle plane and to achieve low reconstruction times. The hardware design was optimized to keep density errors due to the cone angle low. Modern quality standards require highly optimised production methods. For this purpose reliable inspection techniques are needed. The main tasks of the inspection of castings are flaw detection, dimensional measurements and reverse engineering. To date these tasks are performed with a variety of different tools. Inner structures of complex bodies can often not be evaluated because of limitations of the measuring devices. 3D tomography offers the possibility to fulfill all these tasks with a single NDT tool. Nowadays foundry companies need to reduce the product development cycle time in order to be competitive on the market. Therefore, in castings defects like gas porosity, voids and inclusions have to be detected in the early phase of the production process optimisation. The most common NDT method for this purpose is radiography. This inspection method however does not allow the detection and localisation of defects in complex bodies. In the automotive industry it is still common to evaluate the homogeneity of large casting parts like engine units by cutting it in slices. Apart from being destructive, the method is very time consuming. Ultrasonic and eddy current measuring techniques can only be applied in simple geometries. Often, due to the lack of appropriate test methods, foundry engineers do functional tests like leak tests. In this case defective parts cause high costs because the test is usually done at the very end of the production chain. 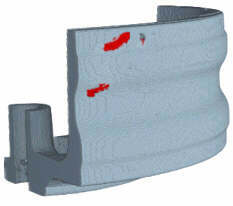 3D Tomography is a non-destructive method that has the potential to detect flaws in any geometry. The reconstruction of the tomograph generates 3D voxel data. It is a three dimensional array with attenuation values which are proportional to the density of the material. This allows to detect voids and inclusions. The 3D data can be visualized in several ways. It is possible to generate any kind of cuts, slices or isosurfaces. Fig. 3 shows a 3D visualization of an aluminium casting. Displayed is the outer surface of the body as it would be in a photograph. Since we have the full 3D information of the body, virtual cuts of any orientation can be done. In Fig. 4 a cut through the centre of the body reveals gas porosity defects. 2D slices can be extracted from the 3D data. The binarized image of a radial slice of the body is shown in Fig. 5. In Fig. 6 an isosurface plot displaying a section of the outer surface of a casting is shown. Voids are marked in red. The voids that appear on the outer surface of the body are visible. But the real size, shape and orientation of the voids only become visible if the aluminium is displayed semi-transparently (Fig. 7). The demonstrated visualization methods offer to the foundry engineers the possibility to analyze the three-dimensional shape and position of flaws. This information can be used to optimize the casting process to ensure a high quality standard. Quality assurance of metal castings includes the control of dimensions and the analysis of the deviation of the real geometry from the nominal geometry. Since the described tomographic system generates 3D data, dimensional measurements can be done utilizing post processing software tools. Fig. 8 shows the structure of the software modules and the generated data. 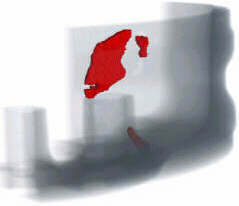 In a first step, the voxel data that have been generated by the tomographic system need to be converted into a surface. The most common format for data exchange is STL (Stereo Lithography) which is the basis for different software modules that will be described in this section. In the phase of prototype manufacturing it is essential for the engineers to know the deviation of the manufactured geometry from the geometry of the CAD drawing. For this purpose the CAD drawing is imported via an exchange format in a software module that compares the STL surface data with the CAD data. Fig. 9 shows the CAD drawing of a test body. It that was manufactured and scanned in a 3D tomograph. The result is shown in Fig. 10 as an isosurface plot. 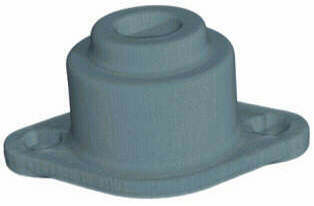 It is visible that the body consists of two materials: A cylinder made of polyethylene with drillings and an aluminium ring placed at the upper part of the body (shown in gray color in Fig. 10). The deviation from real to nominal geometry can be documented in tables showing statistical data like maximum, minimum and average deviation. More informative are graphical representations like in Fig. 11. The picture shows the deviation in different colors. Positive and negative tolerances are given and the tolerance band can be adjusted to give the maximum information about the deviation. Another demand from quality control is the dimensional measurement of cast parts. 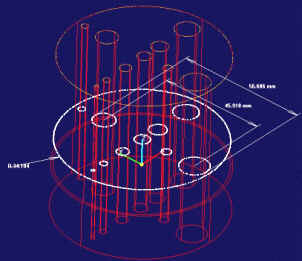 Based on the 3D tomography data, measurements can be done in a similar way as in a CAD program. Fig. 12 shows an example of measurements of the test body. Distances, radii, etc. can be measured in all directions of the 3D space. Finally, 3D tomography can be used for reverse engineering even of complex parts with inner structures. After a surface creation (Fig. 8) the surfaces are imported by a CAD program via an exchange format. The surfaces can be further modified in the CAD program to achieve the final geometry. 3D computed tomography was proved to be a versatile tool for quality control in castings. With a single NDT tool and a single measurement, defects in complex bodies can be detected and analyzed regarding their 3D shape, orientation and position. Dimensional measurements of outer and inner structures can be performed to verify the geometry of parts. The comparison of the real geometry with the nominal geometry allows a fast and non-destructive quality control. Therefore, the system gives new opportunities to foundry engineers to rapidly optimize their production aiming at the minimization of defects and deviations from the nominal geometry. Reverse engineering allows to generate CAD drawings or to copy parts without the need to create new CAD drawings. R.A. BROOKS AND G. DI CHIRO, Principles of Computer Asisted Tomography (CAT) In Radiographic and Radioisotopic Imaging, Phy. Med. Biology, Vol. 21, No 5, pp. 689-732, 1976. L. A. FELDKAMP, L.C. DAVIS, J.W. KRESS, Practical cone-beam algorithm, J. Opt. Soc. Am. A/Vol. 1, No. 6 1984, pp. 612, 1984. P. GRANGEAT, 3D reconstructions for diverging X-ray beams, Computer Assisted Radiology, CAR'85, Springer Verlag, Berlin, 1985, pp. 59, 1985. P. RIZO, P. GRANGEAT, P. SIRE, P. LEMASSON, P. MELENNEC, Comparison of two three-dimensional X-ray cone-beam reconstruction algorithms with circular source trajectories, J. Opt. Soc. Am. A/Vol. 8, No. 10 1991, pp. 1639, 1991. Created with Imageware Surfacer, SDRC corporation.